Product prices and availability are accurate as of 2019-04-19 11:16:04 UTC and are subject to change. Any price and availability information displayed on http://www.amazon.com/ at the time of purchase will apply to the purchase of this product. Ready For Hours Of Creative Fun? 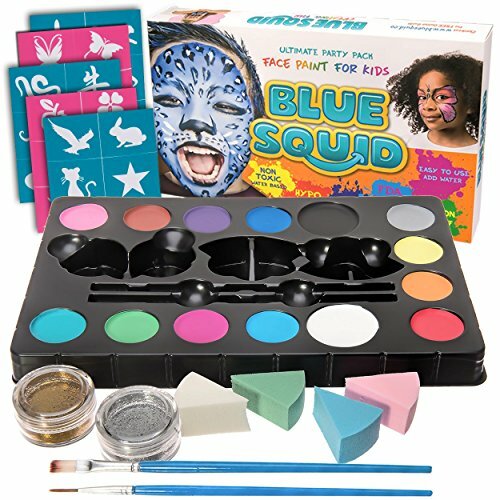 Transform your child into their favorite animal or superhero with this easy-to-use, cosmetic-grade face painting kit! -Perfect for birthday parties, church & school events, Halloween, or just a night of fun at home! -Awesome VALUE: 30 Stencils, 10 x (3ml) vivid colors, 2 x (4ml) black & white, 2 (10ml) gold & silver glitter gel, 2 artist brushes and 4 sponges. We know you'll have hours of fun with your new Blue Squid face painting kits and you'll love creating amazing face painting designs. But if you're not satisfied for any reason (or no reason at all) simply let us know at any time and we'll cheerfully refund every penny of your purchase. This 100% Satisfaction Money-Back LIFETIME Guarantee means you can try our face paint party pack now without risking a thing! Your order also includes a FREE bonus website with online videos that will turn any parent into an almost professional face painter with the many face painting ideas and designs. While we think we've manufactured enough of our face paint packs to keep up with demand, we can't guarantee we'll have any left in stock if you wait and decide to order later. 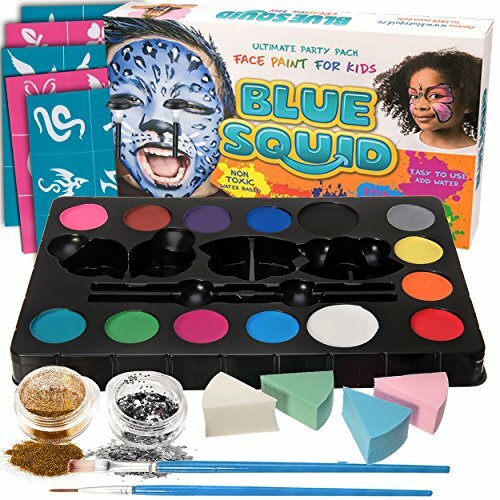 Click or tap the yellow "Add To Cart" button in the right corner of your screen and we'll rush your Blue Squid face paint party pack straight to your front door!
? 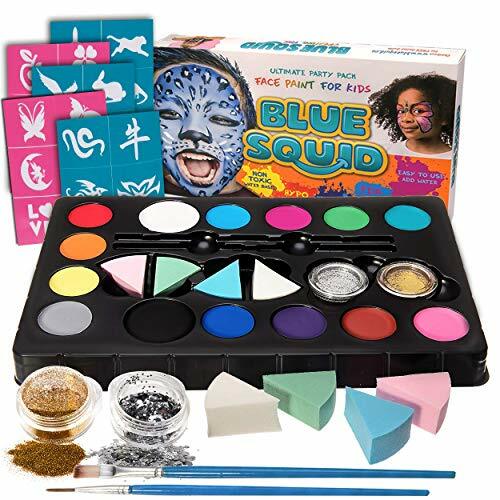 BEST QUALITY FACE PAINT KIT Superior quality cosmetic grade face paint palette containing beautiful bright & vibrant water-based colors. Everything you need to create hours of face paint fun. ? ULTIMATE PARTY PACK Each set includes 10x3g vibrant colors, 2x4g black & white, 2x10ml gold & silver glitter gel, 2 x brushes, 1 x high density sponges, 3 x flocking sponges and 5 x stencils. 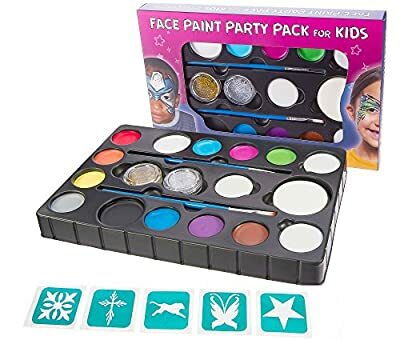 (BEWARE - many face paint sets on Amazon contain only 2g of each color!) ? PERFECTLY SAFE FOR CHILDREN Water based, Non-toxic, FDA-compliant, Hypoallergenic & Paraben-free. Paint that is ideal for children with sensitive skin, read the many reviews of 100s of delighted parents. ? EASY ON EASY OFF Add a little water with supplied brush to apply to face or body. Easy to remove with soap and water. ? MONEY BACK GUARANTEE simple no quibble money back guarantee if you are not 100% satisfied ? BONUS FREE ONLINE FACE PAINTING GUIDE containing step by step video tutorials on how to apply super cool face paint designs.